Our Casa di Campagna retreats challenge your body and rejuvenates your soul. Stay at one of two spectacular retreats on working wineries, one on the Naramata Bench and one in the Okanagan's famed Golden Mile. Spectacular riding forms the foundation but we also include unforgettable dining, exclusive Giro experiences that immerse in the region and plenty of time to just relax and soak in your surroundings. Explore one of the most scenic wine regions in the world with Giro as your guide. Watch the sun set from your hot tub on a deck overlooking Okanagan Lake. Hike to a hidden waterfall - have a four course dinner in the vineyards with a wine maker - explore the history of the region - take a cooking class with a reknowned chef - greet the sunrise with a hillside yoga class before a spectacular breakfast. Paddle to a hidden cove for a wine and cheese picnic. You'd be amazed at how much we can fit into these retreats and still leave you plenty of time to relax. Day One - Welcome to Naramata! We'll meet you at the Guesthouse and get you settled in. 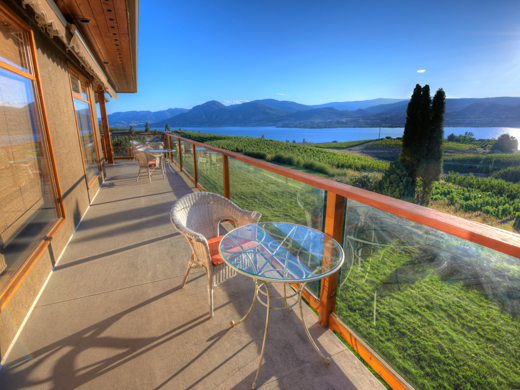 Then, we'll enjoy a glass of Okanagan wine (or microbrew) as we sit on the deck and overlook Therapy's Vineyards. We'll give you a quick orientation and discuss some of the routes and highlights you'll discover over the coming days. Then, we'll shuttle you to one of our regional dining partners for an unforgettable first dinner where you can become acquainted with your hosts and fellow Giro Guests. Day Two - We'll meet you at the Guesthouse after your gourmet breakfast and introduce you to today's guides. This day, we'll set out directly from the Guesthouse and explore the spectacular scenery of the Naramata Bench. For the more adventurous, you'll head north and test yourself on the rollers and climbs of Indian Rock or Chute Lake Road. For the casual group, we'll take the backroads and KVR trail towards Penticton where we'll stop for coffee. Then, we head back to the Guesthouse with stops at cheese shops, wineries and a spectacular lunch at Lake Breeze Winery. From there, it's a fairly easy coast back to the Guesthouse. Supper tonight is a private tour, microbrew tasting and pizza feast at Bad Tattoo. Day Three - After breakfast it's a short shuttle ride for the casual group to Penticton, where we take the KVR spur line trail down the west side of Skaha Lake for a spectacular cruise along the lake to Kaleden. After a coffee stop there, we head to Okanagan Falls and climb to some stunning viewpoints at Liquidity and Blue Mountain Wineries. We then head back to Penticton on the east side of Skaha Lake, stopping for a picnic lunch along the way. The Scenic/Competitive Groups add the challenging ascent up Green Mountain Road and the thoroughly rewarding descent down the backside and down the See Ya Later Wall. Then, we head back to Naramata for a quiet dinner and a sunset paddle on Okanagan Lake. Day Five - It's departure day, but if your legs are up to it, take a last glorious (unguided) ride in Naramata after breakfast and before packing up and checking out. We'll have a few parting mementos for you to help you remember this trip of a lifetime! Day Three - After breakfast it's a short shuttle ride for the casual group to Penticton, where we take the KVR spur line trail down the west side of Skaha Lake for a spectacular cruise along the lake to Kaleden. After a coffee stop there, we head to Okanagan Falls and climb to some stunning viewpoints at Liquidity and Blue Mountain Wineries. We then head back to Penticton on the east side of Skaha Lake, stopping for a picnic lunch along the way. The Scenic/Competitive Groups add the challenging ascent up Green Mountain Road and the thoroughly rewarding descent down the backside and down the See Ya Later Wall. Dinner is at the Vanilla Pod or the Kitchen at Misconduct. Day Four - We'll get up early and board the Giro shuttle for Kelowna. After a breakfast stop, we'll take you up to Myra Canyon where you'll ride over the fabled Kettle Valley route high above the Okanagan Valley. This is one of the most remarkable rail trails in the world! We'll stop for a gourmet picnic lunch at the rustic Chute Lake Lodge, then it's a scenic descent down through the "Little" tunnel and the vineyards of Naramata back to the Guesthouse. Tonight's supper is a private catered vineyard dinner at the Guesthouse followed by a Syrah by Sunset wrap up celebration. 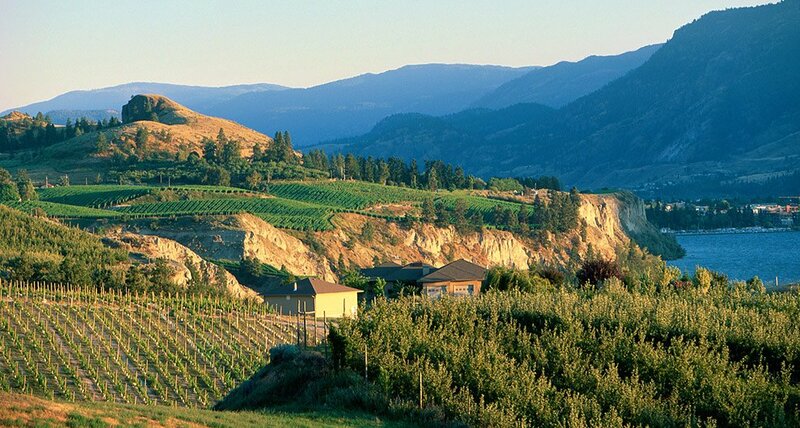 Day Five - Welcome to the scenic Summerland Bench - home of jaw-dropping vistas, rolling country roads, orchards, vineyards, some of Canada's finest wineries and - if you're up to the challenge - one of the Okanagan's most infamous ascents: Giant's Head. After breakfast, we'll shuttle you to the start point of today's tour. The casual group will wind through Summerland and the wineries of Bottleneck Drive. The Scenic and Competitive Groups will head out either to Fish Lake or Garnett Valley through pine forests, farmland and picturesque valleys. Then, we'll all meet for a charcuterie lunch at Dirty Laundry Vineyards. From there, we board the Giro shuttle for the scenic 40 minute ride back to our Guesthouse. Dinner tonight is at the historic Naramata Heritage Inn. Day Six - Today we shuttle to the other side of the lake and continue to follow the historic route of the Kettle Valley Railroad. We'll ride along a section of the TransCanada Trail that follows the route of the KVR as we climb out of Summerland and head through Faulder. We again enjoy a gourmet lunch in the "SuperNatural" BC Wilderness before we return to Summerland and a ride on one of the oldest operating steam trains in North America (schedule permitting). Tonight is a free night for dinner. Either head out on your own or we can make suggestions and shuttle you to the location of your choice. Day Seven - It's our last full day of cycling, but we've saved an amazing wrap up for you! Today, we head south to what is very likely Canada's finest wine growing region - the Golden Mile between Oliver and Osoyoos. The casual group will start from Oliver on the channel trail and cycle down to enjoy the fertile abundance of the valley just north of Osoyoos. There, they take Black Sage Road back towards Oliver, with plenty of stops for wine tasting along the way, including a lunch stop at one of our featured dining partners. The Scenic and Competitive Groups will earn their rest stops today, as they tackle the See Ya Later Wall, Green Mountain Road and White Lake Road before joining us for lunch on Black Sage Road. We meet you in Oliver with a change of clothes and we'll have a shower at the Oliver Fitness Center and Pool (a dip in the pool is optional) and then have an incredible 5 course dinner and wrap up celebration at the Chef's Table at Backyard Farms. Day Eight - It's departure day, but if your legs are up to it, take a last glorious (unguided) ride in Naramata after breakfast and before packing up and checking out. We'll have a few parting mementos for you to help you remember this trip of a lifetime! Therapy Guesthouse is a spectacular 8 suite villa situated in the heart of a working winery. It sits on the Naramata bench, overlooking the vineyards and the quaint village of Naramata itself. Each of the well appointed suites offers a semi-private patio and its own separate entry, full ensuite bathroom, large screen television, DVD player, clock radio, coffee maker, telephone, and wine fridge, and includes high-speed internet. For an extra measure of comfort, their rooms feature “Heavenly Beds” (made famous by the Westin Hotel Group), micro-fibre robes and oversized towels. A gourmet breakfast of pastries, fruit and more, is artfully served on your patio each morning. What better way to greet the day than to savour hot coffee and fresh baking while soaking in a serenity-inspiring lake and vineyard view? With larger groups and advance notice, we can reserve the entire guesthouse, which includes a gourmet kitchen and sitting room with fireplace. Includes Accommodation in Executive Suite. Deluxe Suites available for upgrade fee of $150. Includes Accommodation in Executive Suite. Deluxe Suites available - upgrade fee of $300. 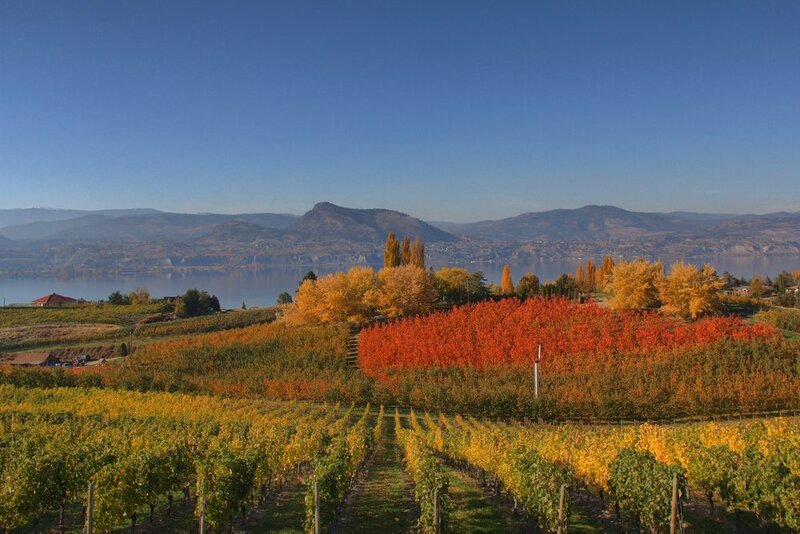 The Golden Mile stretches from Oliver south towards Osoyoos, spanning some of the best wine country in North America. Above the valley sits the Mediterranean inspired Villas at Hester Creek, your home for this spectacular retreat. Prepare for incredible cycling - a sunset paddle on Vaseaux Lake - farm-to-table foraging with Covert Farms - your own exclusive Giro cooking class - an unforgettable sampling of aboriginal culture and cuisine at Nk'Mip Cellars in Osoyoos and a wine makers tour of the South Okanagan's finest wineries. Day One - Welcome to the South Okanagan! We'll greet you at the Villas and get you settled in. Then, it's a relaxing glass of wine overlooking the vineyards as we cover the next few days with you. 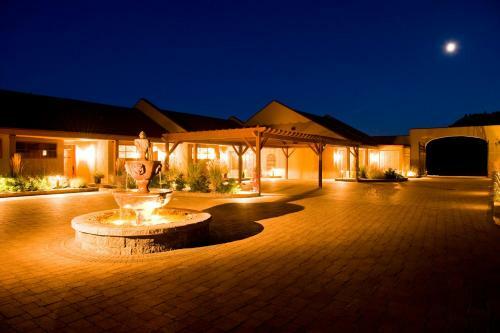 That evening, we wrap up with a special welcome dinner at Hester Creek's award winning Terrafina restaurant. Sleep well - there's a great day of cycling ahead! Day Four - Today is the last full day of riding and we've saved a special off-road treat for you. We'll get up early and board the Giro shuttle for Kelowna. After a breakfast stop, we'll take you up to Myra Canyon where you'll ride over the fabled Kettle Valley route high above the Okanagan Valley. This is one of the most remarkable rail trails in the world! We'll stop for a gourmet picnic lunch at the rustic Chute Lake Lodge, then it's a scenic descent down through the "Little" tunnel and the vineyards of Naramata back to the finish point. This evening, we wrap up with a catered sunset dinner on the patio at Hester Creek. Day Five - It's departure day, but if your legs are up to it, take a last glorious (unguided) ride along the Golden Mile after breakfast and before packing up and checking out. We'll have a few parting mementos for you to help you remember this trip of a lifetime! Day Three - After breakfast it's a short shuttle ride for the casual group to Okanagan Falls, where we take the KVR spur line trail up the west side of Skaha Lake for a spectacular cruise along the lake to Kaleden. After a coffee stop there, we head to Penticton and down Eastside Road. We'll climb to some stunning viewpoints at Liquidity and Blue Mountain Wineries, where we'll have lunch. The Scenic/Competitive Groups will tackle the Anarchist Summit above Osoyoos, then meet up with us at Blue Mountain. Our dinner destination tonight is the Patio at NK'Mip Cellars in Osoyoos. Day Four - We'll get up early and board the Giro shuttle for Kelowna. After a breakfast stop, we'll take you up to Myra Canyon where you'll ride over the fabled Kettle Valley route high above the Okanagan Valley. This is one of the most remarkable rail trails in the world! We'll stop for a gourmet picnic lunch at the rustic Chute Lake Lodge, then it's a scenic descent down through the "Little" tunnel and the vineyards of Naramata back to the Guesthouse. This evening, we wrap up with a catered sunset dinner on the patio at Hester Creek. Day Five - For the Competitive and Scenic Groups, it's another day of climbing as they tackle a section of the historic Ironman Canada route and the Richter Pass past Spotted Lake. For the Casual Group, we'll do a lovely back country loop in the Similkameen Valley, starting in Cawston and going through Keremeos, then following the Similkameen River. We wrap up with a picnic lunch at Orofino Winery, then it's a short shuttle ride back to the Villas. Dinner tonight is at Miradora Restaurant at Tinhorn Creek followed by a twilight kayak tour on Vaseaux Lake with Hoodoo Adventures. Day Six - We explore the Okanagan High Country today. The Casual group starts at Covert Farms, then climb up into the highlands above the Valley, following quiet country roads through rolling ranchlands to White Lake and the Dominion Observatory (called Area 51 by local cyclists). Then, they're rewarded with a spectacular descent past See Ya Later Ranch (our lunch stop) to OK Falls. Then, its a pretty easy cycle back to Oliver along Vaseaux Lake. The Competitive Group does a longer (and steeper) variation on the same route. Tonight is a free night for dinner, but we're happy to make recommendations and provide shuttle service to Oliver or Osoyoos if required (remember, Hester Creek has a fabulous restaurant on the property). Day Seven - It's our last full day of cycling. Today, we'll strike a little further afield and head north to the Naramata Bench. A 50 minute shuttle ride takes us to our starting point in Penticton, wherethe Casual and Scenic/Competitive groups will start. Then, it's a gentle ride along the Bench to the North, stopping for a coffee break in the village of Naramata, then heading back to Penticton with several wine tasting stops and a lunch stop at Lake Breeze's Patio. The Scenic and Casual Groups add a longer loop to Indian Rock (and the climb up Chute Lake road, for those that love to suffer). From Penticton, we take the Giro Shuttle back to the Villas and wrap up with a fabulous 5 course Gourmet dinner at the Chef's Table, just down the road. Day Eight - It's departure day, but if your legs are up to it, take a last glorious (unguided) ride along the Golden Mile after breakfast and before packing up and checking out. We'll have a few parting mementos for you to help you remember this trip of a lifetime! Hester Creek’s six Mediterranean-style Villa suites provide sumptuous accommodation high on the hill, with unsurpassed vineyard and orchard views to the valley below. The suites are beautifully appointed with the utmost attention to detail and comfort, including geothermal heating and cooling, soaker tubs, walk in showers, granite countertops, Stearns & Foster King sized beds, HDTV, fireplaces, and WiFi. A delicious homemade breakfast using regional ingredients is included. While staying at the Villas, we will also offer a gourmet culinary class in their teaching kitchen. With larger groups and advance notice, we can reserve the entire guesthouse.